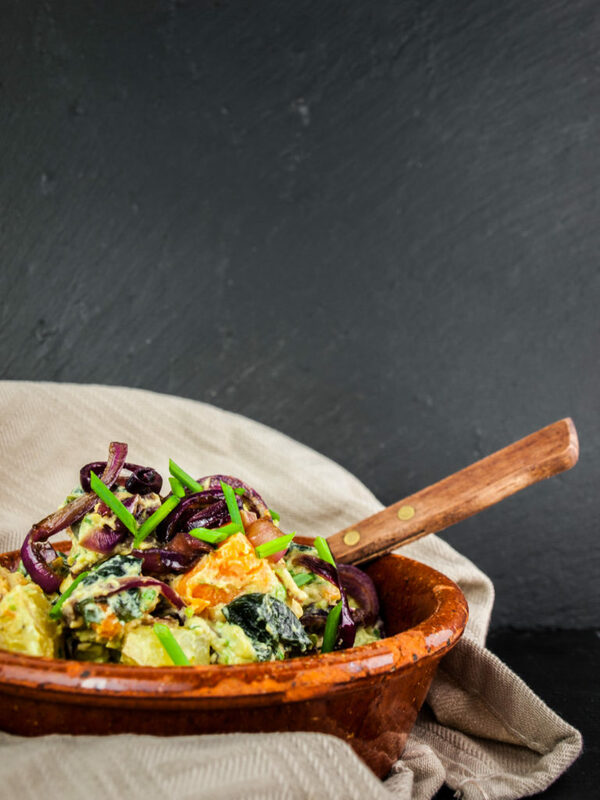 Healthy creamy potato salad with avocado, Greek yogurt & caramelized onions! This creamy potato salad is the perfect accompaniment for a summer barbecue. Even though the barbecue season in the Netherlands already came to an abrupt halt, I kept thinking about potato salad. Maybe because my mom always serves it for Christmas. So for me personally potato salad is an all-year-round dish! Instead of using a fatty mayonnaise dressing, this salad is a tad healthier but still oh-so-creamy. Full-fat Greek yogurt combined with luscious avocado make this salad at least just as silky as the traditional one. You can also make this salad vegan by replacing the yogurt with another avocado. All the flavor, none of the animal products! Add 1 more teaspoon of lemon juice for a little zing and to keep the avo’s from browning. If you want to add a bit more vitamins to your salad, you can add sweet potato as well. It not only provides an additional color, but also a hint of sweetness, as well as a lot of vitamin A and anti-oxidants. Did you know that sweet-potatoes actually count as one of your recommended 5 portions of vegetables & fruit a day? The caramelized onions give a nice mellow, toasty and sweet flavor twist to this potato salad. They bring some additional depth to the salad, alongside extra umami flavor. Umami is that savory, well-rounded taste you often have in good stocks and cooked meats. Speaking about umami, if you really want to amp up the umami taste in your salad, you should add a bit more Japanese flavor. Cook your potatoes in some Japanse dashi stock and add wakame seaweed for extra umami oomph. Seaweed is an excellent source for umami and makes your dishes taste a lot more savory and well rounded in general. You can easily find them in your Asian supermarket. Try it and taste the difference! As with all potato salads, this one tastes better if the flavors had some time to infuse. So if you have the time, make it the day before and let the flavors marry overnight. And now get going and make some healthy, creamy and satisfying potato salad! A creamy but healthy potato salad with lots of vitamins and minerals, that also absolutely delicious! Make some delicious healthy potato salad! Cut the potatoes into bite-size pieces and put them in a large pot. Add water until they are just covered, season with 1 teaspoon of salt. Optionals: If you want to include sweet potatoes, cut them to about the same size as the regular potatoes, add them to the pot. You can also add the wakame and dashi now if you want more umami flavor. Bring the water to a boil, then reduce the heat and let simmer for 10 minutes until the potatoes are fork-tender. Drain thoroughly and let the potatoes cool for 45 minutes. Slice the red onions into rings and transfer to a skillet with 1 tablespoon of olive oil, 100ml water and a good pinch of salt. Put the skillet on high heat and wait until the water starts to bubble. Reduce the heat to medium-low and let the onions cook, stirring occasionally, for 25 minutes. Meanwhile, peel and de-seed the avocado. Scoop the flesh into a salad bowl. Chop the chives and add them together with the yogurt, the mustard, lemon juice and 1 tablespoon of Worcestershire sauce. Season with salt and pepper, then stir everything together with a fork until you have your desired consistency. After the onions finished cooking, add 2 tablespoons Worcestershire sauce to the skillet. Keep stirring for another 5 minutes until the liquid is evaporated and the onions are caramelized and sticky. Add the cooled potatoes (including the seaweed if used) and caramelized onions to the dressing. You may want to reserve some caramelized onions for decoration afterward. Stir until well combined and let the flavors infuse for at least 1 hour in the fridge, even better overnight. Top with the remaining caramelized onions and decorate with more chopped chives. Dig in! Have you ever tried potato salad without mayo-dressing? What would you serve this salad with? Do you think the dressing needs to be more like a traditional potato salad dressing? Share your thoughts and suggestions with us in the comments below! PS: This recipe is inspired by the idea that potatoes share chemical flavor compounds with avocado, dairy, and onions. That’s why they work so well together. Check out James Briscione’s book on food pairing if you are interested in digging deeper into this!